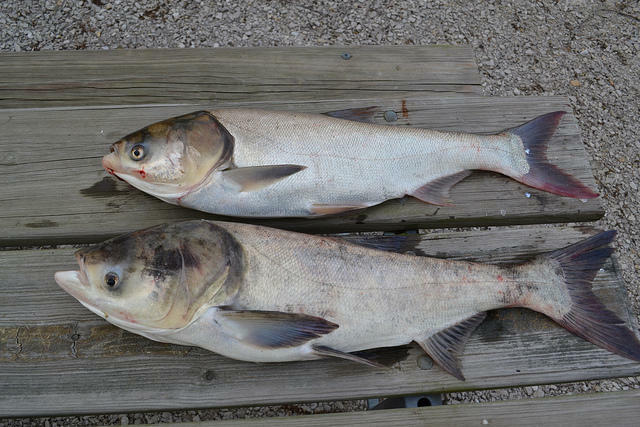 Bighead and silver carp, two kinds of Asian carp that people are worried could get into the Great Lakes. The Corps' plan involves constructing a redundant gauntlet of technologies to keep carp from getting past the lock and dam, including an electric barrier, an acoustic barrier, and a so-called "bubble curtain." "The bubble curtain provides both an acoustic, visual and physical deterrent to fish trying to move through that bubble curtain of water," YoungeDyke explains. Great Lakes states will have to put up 20% of the cost, and Congress would have to approve the other 80%. Governor Rick Snyder says Michigan is willing to pay more than the other states, because it has coastline on four of the Great Lakes. YoungeDyke says most people don't realize the full gravity of the threat. "It's not just the Great Lakes that we have to worry about," says YoungeDyke. "It's every inland lake, it's every river. It's much bigger than most people realize." I woke up this morning thinking about Asian carp. I’d noticed that our state Senate spent much of yesterday doing things like voting to cut funding for those trying to get off Medicaid. Meanwhile, despite the fact that many urban areas like Ann Arbor are overrun with white-tailed deer, the state House was voting to outlaw sterilizing them. I can’t imagine why anyone would say that our lawmakers don’t have their priorities straight. The Army Corps is conducting a study of how to stop migrations of invasive species between the Great Lakes and Mississippi River basins. One option is separating the man-made linkage between the two watersheds in the Chicago area. The study is scheduled for completion 2015. Legislation introduced in Congress last week calls for a quicker timetable. State wildlife officials are concerned that a potentially damaging fish has turned up in the St. Joseph River in Berrien County. Crews will begin an intensive search for Asian carp in the Chicago area tomorrow after finding more DNA evidence of the fish in waterways close to Lake Michigan. Officials found the genetic material above a system of electric barriers that are intended to keep carp out of Lake Michigan. Chris McCloud is with the Illinois Department of Natural Resources. He says crews will go out this week on the North Shore Channel and an area of the Chicago River and look for carp. "We are very confident that if there are Asian carp present in the Chicago Area Waterway System, that they are in very, very low numbers."